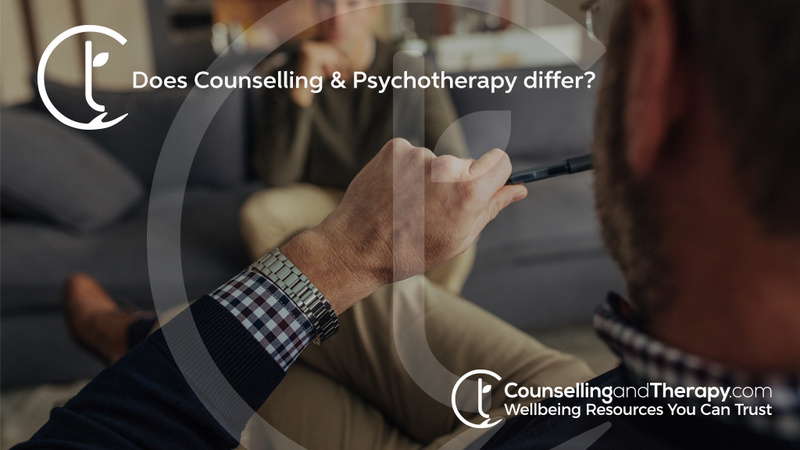 Do Counselling and Psychotherapy Differ and if so, how? Does Counselling & Psychotherapy differ? Up to now the titles of counsellor and psychotherapist have been used interchangeably. More recently however the professions or counselling and psychotherapy have been recognised as different from each other at Government and Department of Health level. The principal differences lie in the depth of work undertaken and the standard of qualification of the practitioners. Counselling tends to deal with more short term or immediate life crises such as bereavement, relationship break-up, stress or work issues. Psychotherapy on the other hand explores issues in greater depth including those that may have their roots in the past such as abuse or trauma and this often requires a commitment to longer term work with a therapist. A psychotherapist is a mental health professional trained to work with emotional, behavioural, personality and some psychiatric disorders. Psychotherapy is dialogue based approach centred on a collaborative and trusting relationship between the therapist and the client which allows open, non-judgemental exploration of emotions and feelings underlying thoughts and behaviours which are causing psychological distress. Psychotherapy aims to alleviate distress mainly through talking rather than medication although other forms of communication are often used such as writing, art work or drama. A psychologist is a qualified professional who has studied the cognitive, emotional and social aspects of human behaviour. They provide mental health care in a variety of settings such as hospitals, clinics, school as well as in private practice. Their focus for psychological well-being is on the thoughts, feelings and motivations that underlie a client’s behaviour. Psychologists can conduct research and test, evaluate and treat a range of emotional and psychological difficulties. Many psychologists are also trained in counselling and psychotherapy although they are not required to do so. A Counselling Psychologist will have completed an undergraduate degree in Psychology as well as postgraduate training in counselling or counselling psychology. A psychiatrist is a medical doctor who has specialised in the area of mental health. Psychiatry is the study of mental disorders, their diagnosis, management and their prevention. Psychiatry tends to focus on mind biochemistry and often utilises medication to alleviate symptoms and facilitate well-being. Some psychiatrists may have training in counselling and psychotherapy although this is not a requirement.